Most days, I love injecting at least a little bit of color or sparkle into my outfits. But then there are days where I just want to dress is black and grey and look like more of a badass than I actually am.  This outfit is definitely a bit edgier than I typically tend to dress, but it’s fun to switch it up sometimes! 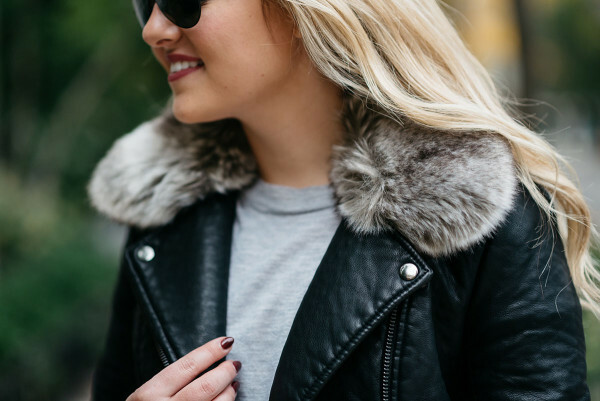 I % dress to my current mood… And sometimes it’s a little more downtown than uptown. When I’m styling a monochromatic outfits, switching up the shades and textures is usually key to keep it from looking too.. plain? boring? Not sure what the word is I’m looking for, but I think creating some visual variety is best! 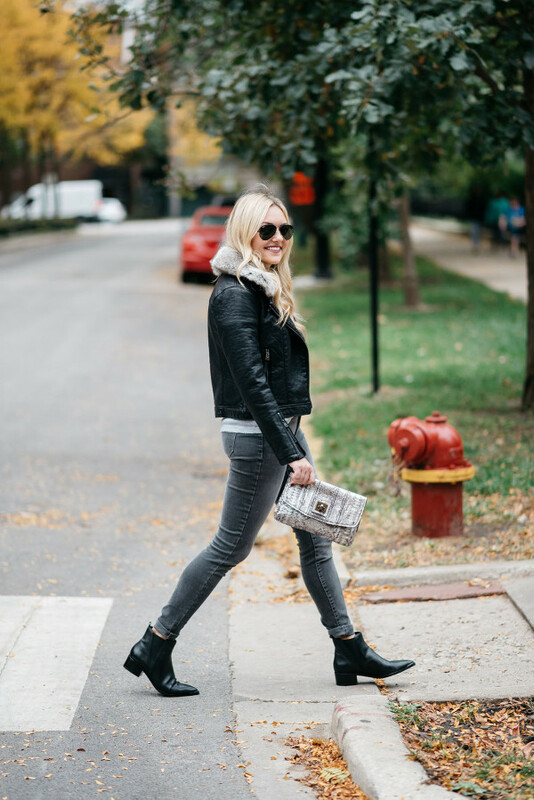 I tried to incorporate some juxtaposition in this outfit with the different shades of grey, my soft cashmere tee shirt and faux fur collar against the edgy leather jacket, and a little pop of shimmer with my metallic clutch. My go-to black sunglasses looked a bit too ‘heavy’ with this, so I opted for a lightweight pair of black aviators instead! I’ve been so surprised at how much I’ve worn these boots lately, too! (Seriously almost every day in Japan!) I thought the pointed toe and low heel would be hard to pull off, but it’s really not. They look great with black jeans, grey jeans, and even regular blue jeans! 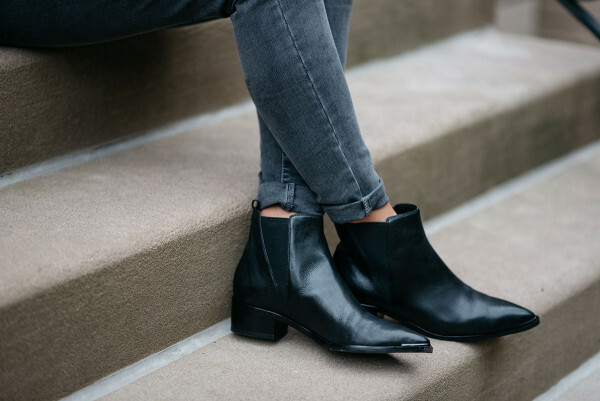 You can tuck your super skinny jeans right into the boot, or cuff them up a little bit for a little something different. This is such a great look on you, Jess! Between that jacket, the boots and the cool AF aviators, you’ve knocked it out of the park. Perfectly styled, rock n’roll outfit! Thank you for promoting vegan clothing!! No animal should die for our fashion! This look is so cute! Your hair looks flawless as always. 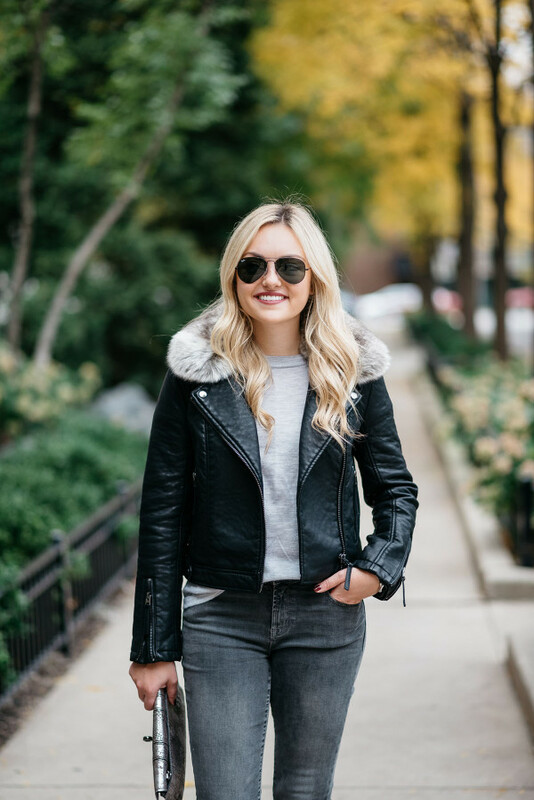 I recently purchased a leather jacket but have been hesitant to wear it – think this post just gave me the inspo to do so! 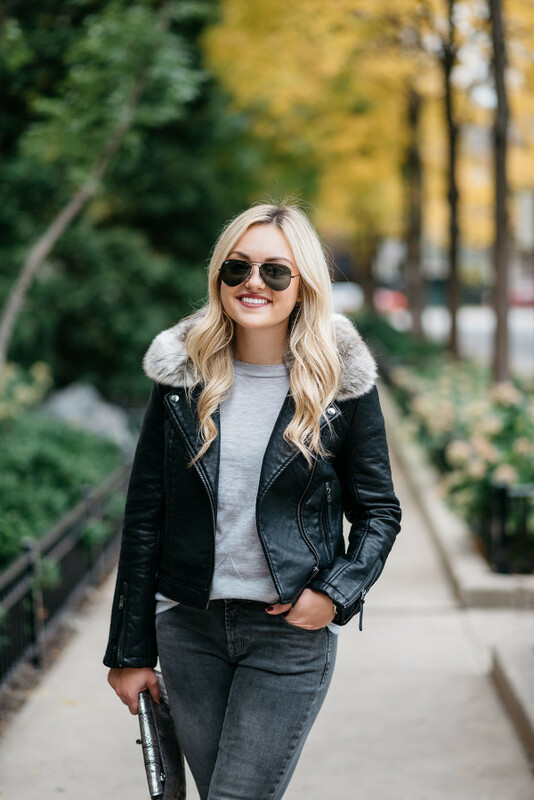 Moto jacket + grey skinny jeans is a great combo.